Last month I wrote about some well-trained, problem-solving animals and the incredible things they accomplished on their own. This month, I’d like to share a few amazing behavioral transformations I’ve seen in my work with rescued dogs. I believe that exposure to complex training tasks helps resolve many behavioral challenges that animals face. The exposure may prepare dogs to cope with the world a bit better. The more training animals receive, the more resilient they become, the more confidence they gain, and the more innovative behavior they demonstrate. I have worked with many dogs that had severe aggression problems. Most were destined to be euthanized because shelter personnel deemed them too difficult to rehabilitate. I am often brought into these cases as an advisor. Given the proper tools, training, and environment, animals can learn solid skills that help their behavior evolve in a desirable direction naturally. I have observed that once a solid foundation for learning and behavior is put in place using positive reinforcement, and is combined with complex learning taught by a skilled trainer, animals will develop desired behavior even when the main focus of later training is not directed toward the original problem behavior. Conversely, I have seen that when step number 5 is missing—there is no advanced, complex, or specialized training that stretches the animal’s thinking—the animal’s aggression in new contexts usually does not improve. I have witnessed this difference so many times that I believe there must be a correlation between the advanced training during a period of no exposure to triggers and the reduction in an animal’s aggressive repertoire. All of these cases began with well-designed, aggression-treatment protocols, giving the animals a solid foundation. Once in a stable home, the trainers were careful not to give the animals an opportunity to rehearse aggressive behavior; other than wise management, no aggression-specific protocols were implemented. Yet, over time, the undesirable aggression fades away. I present these case studies simply as food for thought. Mickey is a pit-bull terrier and former fighting dog that exhibited severe aggression easily triggered by other dogs and by most men. His aggression was managed through the application of counter-conditioning and desensitization techniques. He was adopted by a professional search-and-rescue dog trainer named Jim. Mickey’s aggression treatment was focused on becoming comfortable in his new home and living with the dogs already in that household. Mickey settled into that environment well, and Jim was able to make sure that Mickey did not encounter strange dogs or men. Mickey’s aggression was under control and well-managed. Jim began training Mickey basic search–and-rescue skills, not to introduce him to rescue work but to keep him active and allow him to participate in social activity with Jim’s other dogs. Mickey was a fast learner. Later on, Jim offered to let me use Mickey as part of an imitation project that I had initiated. Mickey became quite proficient at copying the behavior of other dogs, and the project really stretched his cognitive abilities. After 18 months in his new home, Mickey was out in the field with Jim’s other dogs when they had an unexpected encounter with three unknown dogs and two men. Jim was surprised that Mickey exhibited no aggressive behavior; Mickey simply ran to Jim looking confused. Jim reinforced Mickey and moved him away from the strangers. A few months later, they had another surprise encounter with similar results, something that would not have been possible when Mickey first moved to his new home. Because of those good reactions, Jim began to introduce Mickey to new dogs and men carefully and deliberately. I suggested that Jim keep track of these interactions and document Mickey’s responses. Over the next several years, Mickey had more than 50 encounters with men or dogs that would have sparked severe reactivity previously. In all of those encounters, there were only four instances of mild barking, which subsided quickly and did not manifest in any aggressive behavior. 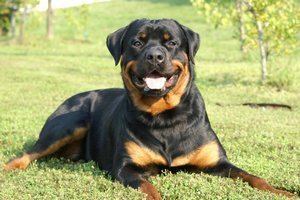 Mellie, a bouncy Rottweiler mix that had been confiscated from a fighting-dog ring, was distrustful and aggressive toward all dogs. Leanne, a professional trainer who assisted the local shelter with severe aggression cases, treated Mellie for her reactivity issues using the Click to Calm approach. Gradually, Mellie was exposed to new dogs below threshold and reinforced for accepting those dogs. This introduction procedure used a combination of counter-conditioning and redirection strategies. Leanne fell in love with Mellie and decided to adopt her. Leanne was also an agility competitor, with three dogs at home. Although Mellie was still reactive to many dogs, she had progressed far enough that her training was focused on simply getting to know Leanne’s other dogs. Leanne lived on a farm and could control Mellie’s exposure to triggers easily. Leanne introduced Mellie to agility training, which gave Mellie an outlet for her unbounded energy. Leanne also started using Mellie as a demo dog for her students. Mellie became one of the dogs the students could use to practice their skills. Mellie seemed to love the challenge of working with new people. Being a trainer-dog required patience, and taught Mellie to generalize to constantly changing styles. Due to several personal changes in Leanne’s life, she had to relocate to the city. Mellie had lived on the farm for three years and had not been exposed to strange dogs in all that time. But in her new living environment, she was suddenly and regularly exposed to new dogs. Much to Leanne’s surprise, Mellie did not react with the severe barking that had been normal for her. She seemed anxious and nervous, but Leanne was able to use redirection and high rates of reinforcement immediately to get through those situations. During their first nine months in the city, Mellie had hundreds of encounters that would have triggered aggression previously. In all of those encounters, Mellie had a mild growling reaction on just three occasions, but was easily redirected. Coral is a high-energy Airedale mix that had been given up to shelters by two different families due to severe reactivity to people, dogs, vehicles, wind-blown leaves, and almost anything that moved. She had bitten several people and was considered a high-risk dog. I decided to bring her into a formal training program, and she was treated for dog-reactivity through a cooperative training protocol that focused on desensitization to context-specific situations. Coral lived in a stable environment with three other dogs. She was cared for by a group of professional trainers, and she participated in educational programs and shows that were designed to teach people about pet adoption and the importance of training. Although reactivity was still an issue, it was managed by being careful not to expose Coral to things that were known to be triggers. She became stable as long as the environment remained stable. In addition to daily show-training, I included Coral in a two-year quantity-recognition project that tested her cognitive skills significantly. During that project, she was adopted to a home environment where she was exposed to fewer triggers. Michele, one of her trainers on the project, adopted her, and Coral moved into a household with two other dogs. Michele continued Coral’s training and began taking her to agility classes. Coral had been through a lot in her life, but, as we assess her today, her reactivity issues have reduced in all but one context: exposure to rowdy kids. Coral is exposed to many other of her previous triggers, such as men, dogs, and bikes, several times daily, with no reactivity. Bud is a nervous boxer that was highly reactive to loud noises and very nervous in the presence of other dogs. He was treated for reactivity to other dogs with a cooperative training protocol, working with other dogs on opposite sides of a fence or gate. Bud became quite comfortable around other dogs but remained quite reactive to loud noises. A social worker and child therapist named Theresa adopted Bud. Theresa lived alone, but worked from her home, meeting troubled kids and their parents in her home for consults. Theresa spent a great deal of time training Bud on basic behaviors, and they did training sessions every day. They would encounter other dogs on walks, and, although nervous, Bud was well-behaved. Theresa worked hard to prevent Bud from experiencing loud noises, but he would occasionally hear something and react adversely, growling, barking ferociously, and lunging toward the sound. While Theresa was seeing her clients, Bud was in other parts of the house, since many of her child clients could be rather unpredictable and noisy. Nine months after adopting Bud, Theresa was hospitalized and was bedridden for nearly six months. A trainer friend of hers, Safia, came into Theresa’s home to care for Theresa and Bud. Safia was a graduate student working on her master's thesis on dog behavior. She asked Theresa if she could use Bud for a series of matching-to-sample studies. These studies continued for more than a year, and Bud excelled. Today, Bud is used by Theresa to socialize with many of her pediatric clients. Theresa was eventually able to start seeing clients in her home again. By chance, she happened to have a string of troubled children who exhibited quite violent behavior: yelling, screaming, throwing a tantrum and stomping on the floor, or throwing things across the room. After one particularly intense and loud incident, with an object being thrown against the door to the back room where Bud was housed, Theresa realized that Bud was surprisingly quiet. A few months later, while they were walking down the street a loud firecracker went off near them. Theresa and Bud both jumped back and were startled, but Bud did not bark or growl. Today, Bud is used by Theresa to socialize with many of her pediatric clients. Some of these kids will yell or make other sudden noises, at which point Bud just moves to the other room. He no longer demonstrates aggressive behavior around loud noises. Theresa estimates that Bud hears loud and surprising noises three or four times each month, but for the last two years he has had no aggressive reactions to those sounds other than to look toward them and move away. I have worked with dozens and dozens of aggressive dogs. The most impressive changes have occurred with dogs that have had a lengthy break from exposure to triggers combined with lots of fun, advanced training as part of a stable program. When that advanced training is not part of the equation, most of the dogs I’ve worked with continue to have aggression challenges. Did it stretch the dogs’ abilities and help them become more adaptable, confident, and accepting of changes? In the cases I have presented, the aggression problems diminished because of a combination of factors: a good initial treatment protocol, a stable loving home, a long break from the triggers, a positive-reinforcement training environment, ongoing daily training, advanced training, and the passage of time. It is impossible to separate each of these components. As I compare the cases above with similar cases that did not include the advanced training element, I can’t help but make the connection. The advanced training alone did not solve the aggression problem, but did it stretch the dogs’ abilities and help them become more adaptable, confident, and accepting of changes? It is a question that I think requires further investigation. We know training is beneficial. I present the cases of Mickey, Mellie, Coral, and Bud to open a dialogue and to encourage further investigation into this phenomenon. I look forward to hearing from others who have experienced similar transformations.